Wow So Pretty! The vanity is my favorite piece. Lucky lil sis you have! WOW! I never thought an all white bathroom could look so polished and sleek!! Please post more of your work, its a wonder! It's glorious!! What a transformation!! 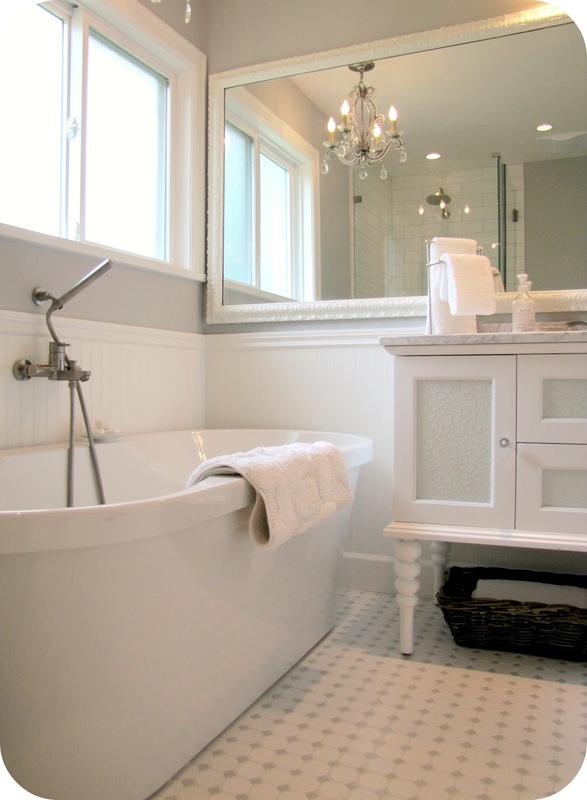 A far cry from the lavender awesomeness that was the old tub!! 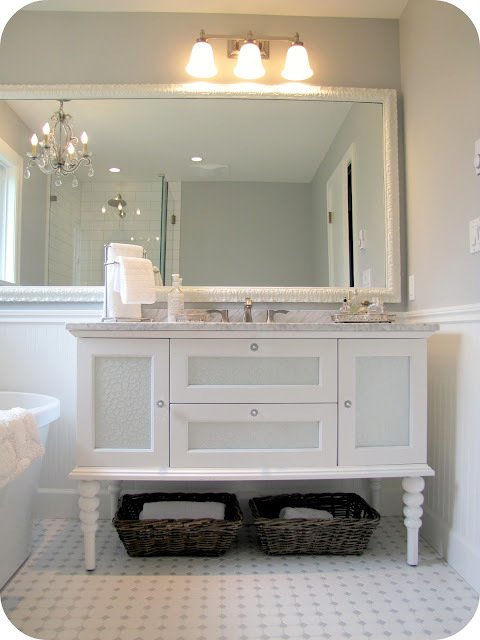 I love the legs of the vanity. This is so lovely and very similiar to what I hope our master bathroom will look like when our own renovation is done,(minus your beautiful tub)as our space is quite a bit smaller. this is so fresh and clean love it..
Wow. What an amazing transformation from the mauves to the whites! Love it. I may or may not, have to use the loo the time I'm at your folks!!! ;-) guess it would be pushing things to take a bath!!! OH my that is amazing! I am so happy for all of you that get to use it!...What a wonderful job you all did! 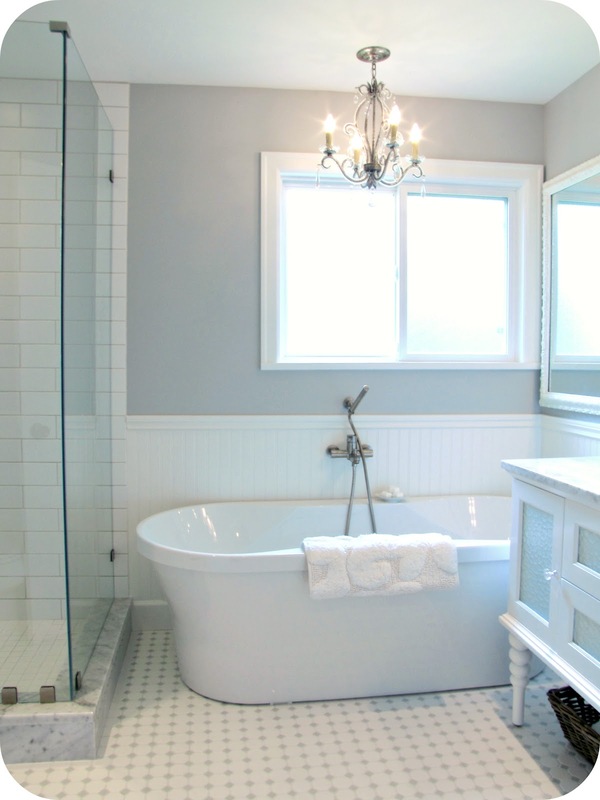 This bathroom looks immaculate! 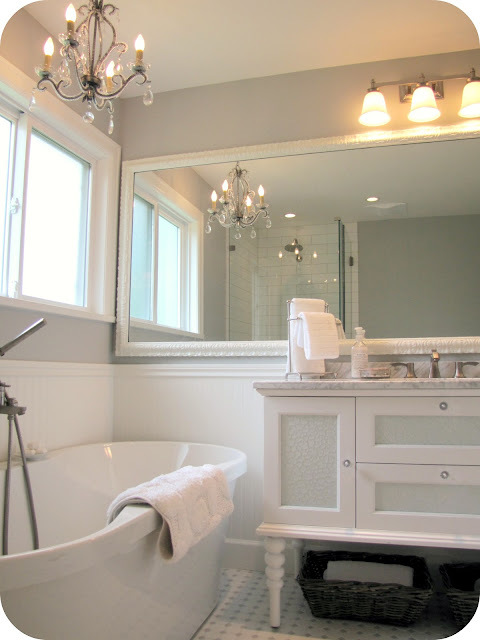 I’m pretty sure that you are now enjoying relaxing bath times in your beautiful bathroom. All the pieces complement the overall look of the space, but what I like most is the different patterns used to decorate the area. It breaks the monotony of the bathroom and gives it an interesting look. 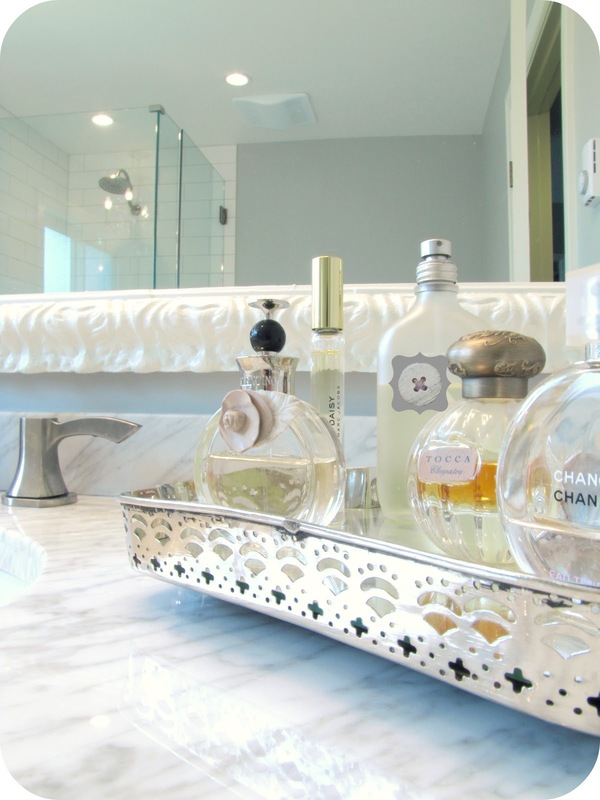 This bathroom is a sight to behold! It is majestic and very elegant. Though the majority of the design and pieces are in white and gray tones, it does not look dull or uninteresting. Rather, the color makes the room look lighter and more spacious! 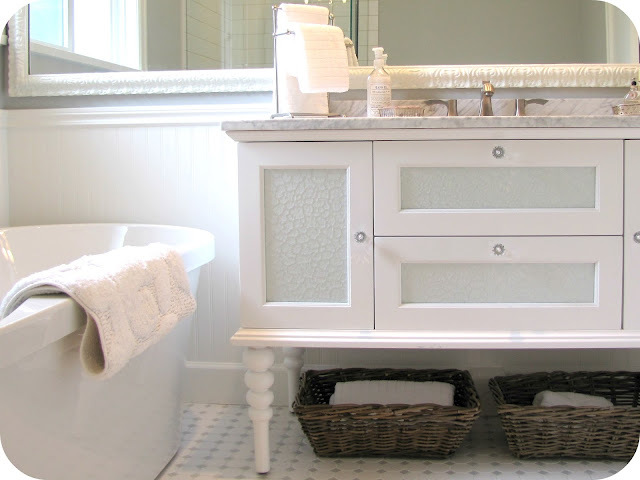 And the simplicity of the look makes this bathroom attractive and pleasing to the eye. Where can I get that vanity!? Where can I find the vanity? Love, love, love the vanity. Where can one find? 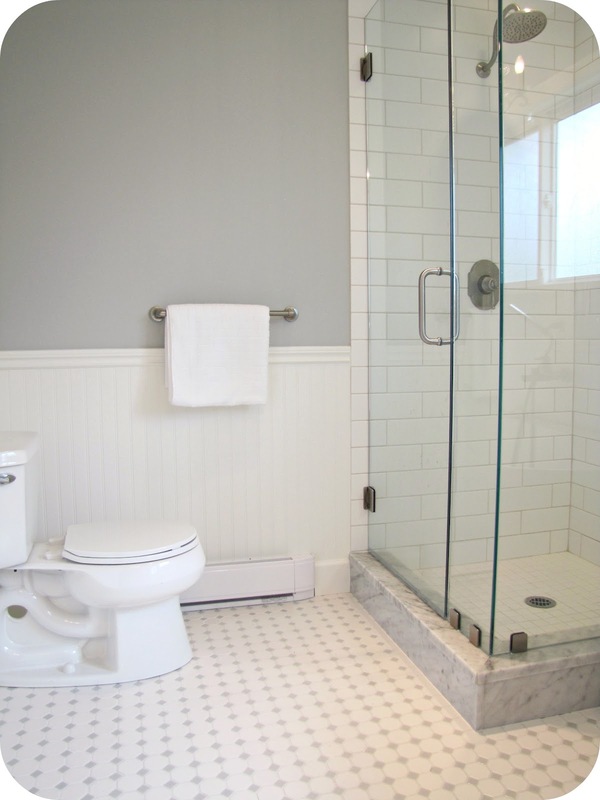 Hi there, I am currently renovating my bathroom and my shower is almost identical to yours. Would you share where the marble you used for your curb is from? I am acting as my own gc, so any info would be so helpful! Thank you! Yes maybe, but home improvements can also be done even if you are still on your own house and have no plans of selling it.